This product from Chess Baron: It's been a couple of years in the making, but now the latest chess database program is in production, a product from the company that pioneered the the technology. ChessBase 10 provides you super-fast access to an online database with the latest chess games, kept topical and up-to-date by ChessBase. 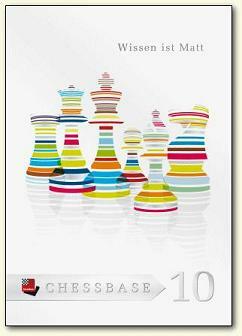 With ChessBase 10 we enter a new era of chess databases. With our new version, waiting for search results is just as much a thing of the past as is the worry about your database being up to date and complete. Instead of that, the whole chess cosmos is at your fingertips with ChessBase: almost four million games from the start of the history of chess until the top tournament played just a few weeks ago, it is all there and only the press of a button away. ChessBase Magazine subscription for one year - the worlds only interactive magazine.